Over the weekend I took my dog Dixie to one of the many dog parks nearby and let her swim her little heart out in the enclosed lake. 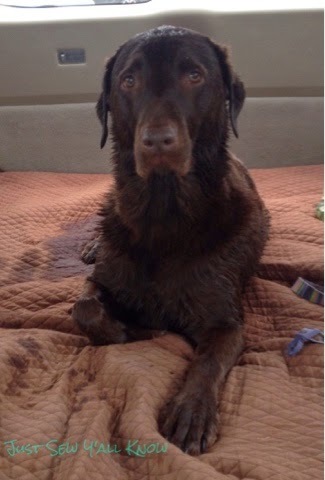 I’m convinced it’s nearly impossible to keep a Labrador out of the water (lake, ocean, baby pool, mud puddle…you name it)! The car seat protector I made really comes in handy when you have a tired pup soaked head-to-toe to drive home. As I mentioned in my last post, I’ll playing catch up for a while to share some things I’ve made but haven’t blogged about. One of them is a wine bottle holder I made for a friend who kept Dixie for several nights. I used Kate’s awesome tutorial over at Needle and Spatula to put it together and I love how it turned out! I’ll be mailing it off tomorrow so I snapped a few pics to share. This entry was posted in car, Dixie, dog, Pet, wine bottle. Surely you thought I was one of those bloggers who posts for a while then drops off the face of the earth, and granted, I did for a few years. There have been some major changes in my life, but all for the better. Over the past two years I’ve been traveling to California for work quite a bit so time in my sewing room has been erratic. I’ve managed to finish a handful of projects, which I’ll start sharing in the next few posts. First up: I bought a SUV and decided to make a padded cover for the back so my dog would be comfortable on trips, but mostly to protect the seats and mats from her claws, hair and any dirt she tracked in from trips to the dog park. To get a template for the shape, I laid out newspaper in the backseat and arranged the pieces to fit around the curves, then taped it all together. The top layer is a pre-quilted fabric that matches her hair and the bottom layer is nonslip fabric with rubber dots. In between I sandwiched two small comforters I picked up at Big Lots for about $10 each. I added elastic straps at one end to slip over the headrests to protect the floorboard in the backseat. I’m pretty pleased with how it turned out and other than wrangling all those layers through my sewing machine, it was easy! This entry was posted in car, Dixie, dog, Pet. Geez I can’t believe it’s been so long since I posted! I’ve been busy taking a class on preparing taxes (even though I’m a CPA – company policy! )…I won’t bore you with the details. My grandmother had a quintuple bypass (open heart surgery) a week ago and is still in the hospital. I was fortunate to be able to use a buddy pass from my inlaws to fly home to Mississippi to see her for a few days. And in 6 hours I start a two day long “Policies and Procedures” class for the tax company. And I’ve also been cranking out some of Anna’s gathered clutches for Christmas presents! I so love her pattern. This entry was posted in baby, bag, clothes, clutch, grandmother, quilt. I cut them in half and added piping I made from a blue and green stripe fabric I found at a local fabric store. I used leftover blackout fabric for the backside of the curtains. Right when you walk into the office, there’s this window that looks directly into the room where the therapist works with the child. (The light in the room is off in this picture.) Kayse wanted a curtain here to give the child some privacy while still letting the parent hear the session. I had just enough fabric left to make this curtain, which hangs on a tension rod. It looks the same on both sides. I had some leftover brown fabric which I used to make the ruffle at the bottom. I think they turned out pretty cute, and Kayse was very pleased! This entry was posted in circles, curtains, piping. My inspiration came from the design of the stair rails at Fort Macon State Park in Morehead City, NC. Here are the two blocks I made using this tutorial…Very easy, right? 1. From each fabric, cut one strip 12.5″ x 4.5″ and two strips 13″ x 4.5″. 2. Take the 13″ x 4.5″ strips (all four of them – 2 blue, 2 purple) and make one cut to divide each strip into a 3.5″ x 4.5″ piece and a 9.5″ x 4.5″ piece. 3. Layout your blocks and sew together! The arrows indicate the direction I pressed my seams. This entry was posted in block, do. Good Stitches, Fort Macon, Hope, tutorial. Well I have a few bags to show you! I made two identical bags like this (see Anna’s tutorial for instructions) a while back but kept forgetting to post a picture. I made one for my mom and one for my grandmother. For my stepdad Mark, I used Anna’s tutorial except I didn’t gather the background fabric. I used my machine to write a message on the inside of the bag. I like to keep those tiny plastic bags that extra buttons or thread come in when I buy a new pair of pants and the like. I was keeping them in a sandwich size Ziploc bag and decided to make a small fabric bag with a snap closure for them. Below is what I came up with. I didn’t use a pattern – I just improvised! This entry was posted in bag. Did you happen to see this gorgeous fall wreath over at Flamingo Toes? I was so in love with it that I followed her tutorial and made my own! I picked up the wreath at Walmart for $3.50! I made the fabric rosettes from my stash of course. For the “FALL” pendants, I picked up the stick-on letters and this scrapbooking paper from Michael’s for under $4 total! To hang the pendants, I used this Camel yarn that I think I got from my grandmother. Not bad for under $8! I’m linking up to Made by You Monday! This entry was posted in ombre, wreath. Brayden’s Baby Clothes Quilt – Finished! The little boy’s name is Brayden Saylor, which I put on the back. I used Elizabeth Hartman’s instructions for making the letters. Click “keep reading” to see close-ups of the individual blocks. I’m linking up to Made by You Monday! This entry was posted in baby, clothes, quilt. This view almost makes binding enjoyable! Almost. This entry was posted in baby, binding, Dixie, quilt.